The deYoung museum staff mistook Modigliani’s portrait of Pierre Edouard Baranowski for a poor forgery of its more popular twin painting and officially de-attributed the painting, disowning the poor thing. Basically they thought this was a cheap, hardboard knock-off which is pretty rude tbh. Then, after some research, paper trails, fingerprint dusting, and x-rays, the “experts” decided that actually probably it is a legitimate child and invited it back home, so to speak. But all that caution, while hasty, is not a bad idea. The romantic trajectory of Modigliani’s life – womanizing, drug abuse, charming wit, early death – is a great bedfellow for work that was highly sought even during his short time on Earth. 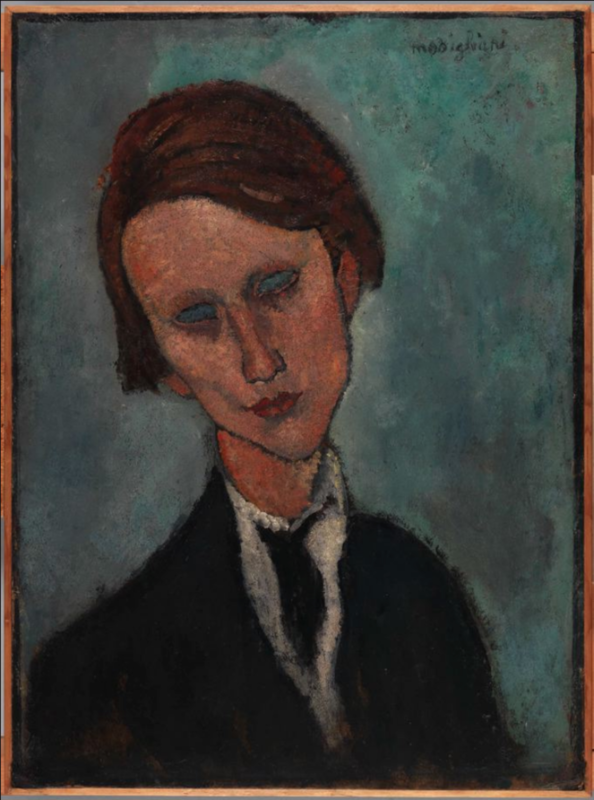 The upshot is Modigliani’s paintings and sculptures are among the most violently bidded-on works in the art market, his Nu Couché went for $170.4 million at auction in 2015, putting him in the company of other wildly over-priced artists like Warhol and his fellow countryman Giacometti. We don’t know how long he took to paint Nu Couché, but Taylor Swift needed a whole year to earn the same kind of cash so the dead artist is doing pretty well for himself. Where there are bankrolls, obviously there are people looking for their slice, Modigliani is one of the most-forged artists, there are reportedly at least 1,000 Modigliani fakes in circulation. There’s even a market for “authentic” Modigliani knock-offs by well known forger De Hory, and a resulting market of fake De Hory forgeries like some kind of arty Inception. On top of all of the fakes, Modigliani’s work is inconsistently catalogued, to say the least. Shoddy scholarship is sometimes to blame – one prominent scholar has been arrested a couple of times for falsely authenticating forgeries. But Modigliani was also in that class of bohemian creatives that traded drawings for drinks in cafés. As Cocteau put it, “He used to hand out his drawings like some gypsy fortuneteller.” Not a culturally sensitive nor particularly clear metaphor but you get it, Amedeo made it rain art. All of that wildness brings us to the deYoung’s awkward back-pedal on this tender, gender-bending portrait of Baranowski. The subject was one of Modigliani’s friends, an aspiring painter who frequently exhibited work in Parisian salons. The depiction is so arresting that it changed history. Baranowski is incorrectly known as an aspiring poet (of whose no poems survive), simply because Modigliani depicted him in such striking, transcendent melancholy – which seemed a more fitting mood for a poet than a painter, as it were.